Horizontal dial approximately 10 feet in diameter. Made of concrete and granite. Commemorates Arizona Dept. of Transportation employees who were killed in the line of duty. This cast iron horizontal dial is set in a 6 foot diameter limestone base 2 feet off the ground. The interior region of the dial face is a white tile mosaic. The gnomon has pictures of buffalo and a horned lizard done in relief. The edge of the dial is a cast iron ring, upon which are four cardinal points and hour markers from 5am to 7pm, likewise in cast iron. The dial is corrected to mountain standard time. Built as an Eagle Scout project, this 10 x 5 foot semicircular concrete and steel dial features a 3 foot tall figure of a coyote as the gnomon. The tip of the coyote's nose functions as a point-in-space gnomon. The figure is placed well forward, limiting the times and dates the nose-tip shadow will fall within the hour circle to about 9 am to 3 pm on dates near the summer solstice. An 8 x 9 foot horizontal dial of powder coat painted aluminum panels 1/4-inch thick assembled onto a concrete pad. Perimeter shows Arabic hour numerals 9-2 with 5-minute dots placed in arcs below the numerals. EOT correction is provided through four graphics on the dial face under the gnomon and sliding "T Square" indicators showing the corrections on rulers. EOT values are corrected for longitude. Dial face plates are supported on poured concrete pad. Dial is on private property. Contact the owner to arrange viewing. Very handsome equatorial dial of bronze and marble, approximately 50 in. diameter. Sits on a triangular base atop marble pedestal 39 in. x39 in. x24 in. high. Inside brick-walled enclosure about 21 in. square. This analemmatic sundial is painted on concrete. 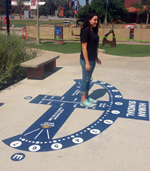 It is similar to John Carmichael's human sundial at Flandrau Planetarium at the University of Arizona. The orange background was painted by hand with acrylic paint on top of the blue acrylic court surface. Lettering and other markings were painted with Rustoleum spray enamel using stencils from Stencilease.com. Final touch up painting was done by hand. It took a three man team ten days to paint. It's quarter hour time marks are longitude corrected and shows Standard Time when readings are adjusted using the Equation of Time. It includes a central Date Line for standing, using monthly and weekly marks. There is a Solar Noon mark, and Bailey Points to indicate the direction of sunrise and sunset. A 10 foot diameter horizontal dial with steel gnomon. Live desert plants fill planters delineated by hour lines. An 18x20 inch cast bronze vertical dial declining 22? west of south on the wall of a private home. Dial face includes a stylized sun and outline of Thumb Butte, a prominent local landmark. Dial can be viewed by first contacting the owner. A 108-inch diameter granite dial face with a 92-inch steel gnomon and nodus. Dial furniture includes a solar noon mark, sunrise and sunset points on the solstices and equinoxes, ecliptic date lines and an EOT graph. A declining vertical stained glass "Gecko" sundial 58 x 20 inches consisting of 153 colored glass pieces and exterior rod gnomon with triangular base. Paintings on 11 glass pieces use vitreous kiln-fired enamels and stains. Dial and four adjacent panels consisting of 540 glass pieces are set in bay window overlooking succulent garden containing additional sundials. Dial glass panel includes painting of a Tucson Banded Gecko stalking fly, a star field, sun face and solar noon mark. Dial declines 27.4? east of south. Contact owner John Carmichael to arrange viewing. Four vertical dials on the faces of a 100-inch tall redwood cupola on the roof of a private residence. The 21-inch dial faces are kiln-fired porcelain on steel; the bezels and gnomons are copper. The dials are longitude corrected for MST. Three dials have solar noon marks. A vertical 44x92 inch dial declining 4.53? east of south painted on the rough textured stucco wall of a private home. The 2x4 inch tall conical horizontal gnomon is gold plated brass. The dial face is hand painted with elastomeric acrylic exterior house paint. The horizontal conical gnomon optimizes the nodus shadow at the location low latitude to show time and date. Dial face shows date/declination lines, solar noon mark and hour, 1/2-hour and 15 minute lines. To arrange viewing, contact owner Christina McVie. Located on a side street wall of a private home, this 4x6 foot due south vertical dial uses welded iron numerals and gnomon. Built in 1954, this is the oldest known sundial in Tucson. Designed using Mayall and Mayall's "Sundials" and described in detail in April, 1954 Home and Garden Magazine. A horizontal sundial 45 x 61 inches with a monofilar brass cable gnomon and tension counterweight. This is the largest horizontal sundial in the US carved on a single piece of stone, taking two years to build. The dial has hour lines from 5am to 8pm, corrected for longitude. Each hour line has an analemma and in the lower right of the dial is a graph of the Equation of Time. A nodus on the wire gnomon indicates date, with declension lines for summer and winter solstice, equinox, and date lines. Time and direction of sunrise and sunset are marked on the equinox and solstice lines. At the base of the gnomon is a 16-point compass rose. On the left side of the dial is a table for telling time by moon shadows. In the center is a copy of the hands from "The Creation" by Michelangelo. A simple square horizontal dial 20 x 20 inches carved in a 3 inch block of granite with a bronze gnomon. The dial has hour lines from 6am to 6pm for local solar time. No graph or table for longitude and Equation of Time corrections. Dial sits atop a 3 foot square pedestal. A brass and concrete analemmatic dial set in the Butterfly Garden at Colossal Cave Mountain Park at 3415 feet elevation. The dial is 21 feet E-W across the hour markers. A hand-held rod gnomon 143 inches long includes a bubble level for positioning. There is a modest park use fee to view this dial.